Teeth whitening is definitely the most popular cosmetic dental treatment that we carry out at Ancells Farm Dental Clinic. We receive many enquiries via email, Facebook and by phone, during which we are asked a number of recurring questions regarding teeth whitening. In this blog, i have attempted to answer some of the more frequently asked questions about teeth whitening. 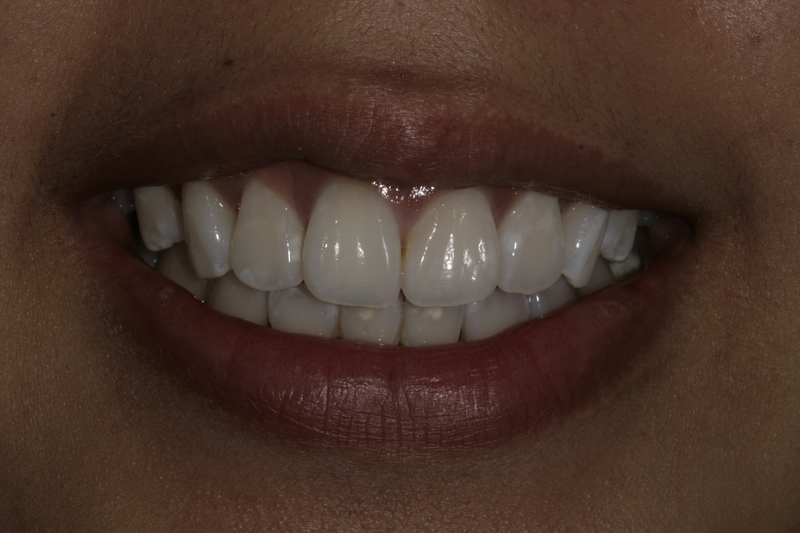 The most common and effective technique is by wearing custom fit teeth whitening trays with a hydrogen peroxide based gel applied to them. The trays hold the gel against the tooth surface, which then removes stains and lightens the enamel. The trays are worn for either 30-45 mins or overnight (depending on the type of peroxide), every day for about two weeks. Teeth whitening is completely safe for your teeth, providing that a dental professional provides the treatment. A dental professional will almost always use a hydrogen peroxide based system to whiten your teeth. Hydrogen peroxide based gels have decades of research behind them to prove that they do not adversely effect, damage or weaken your teeth’s enamel. Hydrogen peroxide, when used in the correct strength and when administered by a correctly trained dental professional, will not burn your gums either. Hydrogen peroxide has never been shown to damage the nerve inside the tooth either. Sensitivity is a very common side effect associated with teeth whitening. It is a temporary symptom, that resolves once the whitening treatment has finished. It can vary from mild to severe. Some people will suffer no sensitivity at all. People who already have sensitive teeth will not necessarily suffer more sensitivity with whitening than those who do not. As a general rule of thumb, seven shades lighter. This does not mean a great deal to most people, as most people do not know what our shade guides look like. However, at a consultation, we can show you which shade your teeth are and where you may realistically get to on the shade guide. Some people may go whiter than seven shades, some people only five or six. I like to think of teeth whitening being similar to sun tanning. If two people sunbathe for the same amount of time, in the same sunshine, one will usually tan more than the other. Expectations must be realistic. Teeth whitening will never make teeth “paper white”, but will improve the shade of the teeth a noticeable amount. I Have Crowns or Veneers. Can I Still Whiten? You can, but you need to be aware that the crowns or veneers will not whiten. Teeth whitening only whitens natural teeth. If your crowns or veneers are at the front, this may be a problem. Sometimes people want to replace old crowns or veneers anyway. If this is the case, then whitening must be done before any replacements. Sometimes old crowns or veneers are lighter in shade than the natural teeth to begin with. In this case, it is often possible to get away without having to replace any restorations. I would always warn people who want to whiten with front crowns or veneers, that they may have to be prepared to replace them after the teeth whitening treatment. Teeth whitening is generally long lasting. There has been a study to show that even ten years after a teeth whitening procedure, the teeth are still not back down to the original shade. That said, people generally want to top up much sooner than that. Whitening results can be very subjective and people can get used to how white their teeth are and think that they are going yellow, when in fact their has been very little fading of the shade. Topping up whitening is very easy and cost effective. usually only a few days every six months or so is adequate to maintain the shade. Not at all. Our teeth whitening costs only £199. This includes all of your appointments, the custom fit whitening trays and the gel required for two weeks of whitening. Teeth whitening is one of the most cost effective way of changing your smile. I Have Teeth That Were Stained By An Antibiotic During Childhood. Can I Whiten? People who were given an antibiotic called Tetracycline as a child may have a “banding” type stain in their teeth. This appearance can be treated by teeth whitening, but can take a significantly longer period of time. Tetracycline stained teeth may take up to three months to whiten.